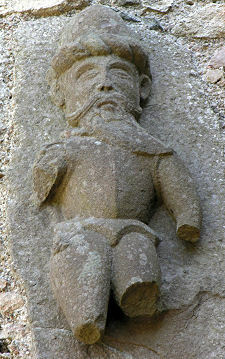 William Forbes, 7th Laird of Tolquhon, lived from about 1520 to 1596. He was an influential figure in parts of what is now Aberdeenshire and was responsible for the redevelopment of Tolquhon Castle and the building of the Tolquhon Tomb, in which he was buried. The wider picture in Scotland at the time is set out in our Historical Timeline. William Forbes was the son of Sir Alexander Forbes, 6th Laird Of Tolquhon, and Alison Anderson. William's older brother John Forbes was beheaded for treason by James V in 1537, but the king then seems to have had second thoughts and compensated the family by appointing William to become of the gentlemen of his bedchamber in 1539. The 6th Laird, Alexander, was killed by the English at the Battle of Pinkie near Musselburgh on 10 September 1547 and William succeeded to become 7th Laird. William Forbes was wealthy by the standards of the day, and unusually enlightened. Among his early acts was endowing a hospital for the poor in Tarves, near the traditional family seat at Tolquhon Castle. The castle that was inherited in 1547 by William Forbes was probably little different from that inherited by his ancestor Sir John Forbes in 1433. It isn't clear what finally prompted him to replace the castle that had been his home throughout his life, but an inscribed panel on the gatehouse dates what happened very precisely: "Al this warke excep the auld tour was begun be William Forbes 15 Aprile 1584 and endit be him 20 Ocober 1589." By the time the new Tolquhon Castle was completed, William Forbes was a very old man and his thoughts were clearly turning to his mortality. In 1589 he inserted in the south aisle of Tarves parish kirk a magnificent monumental tomb to his own memory and that of his wife, Elizabeth Gordon. 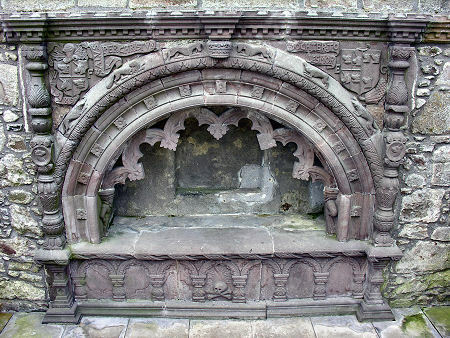 William Forbes was laid to rest there on his death in 1596 and his heirs inherited the castle. The old kirk at Tarves was replaced by the current parish church in 1798 on a site moved just a few yards to the north, but the Tolquhon Tomb was retained together with its backing section of kirk wall. Today it is protected from the elements by a modern transparent structure. William and Elizabeth had three sons. The oldest, another William Forbes, became the 8th Laird of Tolquhon. The youngest, James, was eventually knighted and went on to become Sir James Forbes, 1st Laird Of Knappernay.